The burning question on many people’s mind is “How do we explain the lack of recognition on the part of the two disciples who were making their way home to Emmaus?” Many would explain it in a pretty ordinary and psychological way. You know how an intense attention to a single object of focus can make a person oblivious to events around him or her. Many of us know what it means to blank out, when something troubles us. Grief certainly has this effect. And remember, these disciples were indeed grieving. They had lost their bearings and sense of spiritual direction. St Luke notes, “Their eyes were downcast.” When the Lord died, they lost all hope. Perhaps, so absorbed in their own grief, they failed to recognise that it was the Lord who was walking beside them. They were also walking in the wrong direction – away from Jerusalem, away from the tomb, away from Christ. You don’t need to be a rocket scientist to appreciate that the sun rises in the East and sets in the West. The disciples were walking westward when they should actually be heading East, in the direction of Jerusalem. The Latin word for the East is “Orient”, a word that has entered into our English vocabulary and the word ‘orientation’, a derivative, means direction. The East has been traditionally the direction to which Christians turn towards at every mass, thus explaining the term, “ad Orientem” or “facing East.” In the early Church and for centuries thereafter, churches were built in a manner where the main altar would face eastward. Why would such a “kiblat” or “orientation” be significant and necessary? The East points to Our Risen Lord and Saviour. When we say we face the East to pray, we are actually saying that we are facing Christ, the Morning Star, the Light of the World, the Rising and Unvanquished Sun. To quote St. Augustine, “When we rise to pray, we turn East, where heaven begins. And we do this not because God is there, as if He had moved away from the other directions on earth..., but rather to help us remember to turn our mind towards a higher order, that is, to God.” St. Augustine always refers to this turning to the East in prayer at the end of his homilies, using a set formula, Conversi ad Dominum (“turn to face the Lord”). In a liturgical conference in the middle of last year, this liturgical direction of prayer became a topic of hot debate, following the call of Cardinal Robert Sarah, the Prefect of the Congregation for Divine Worship, for priests to begin celebrating mass ad orientem. There were immediate reactions from several bishops and to assuage the growing mob of protestors, the Vatican Press Office had to clarify that there has been no change in liturgical law. Many who were opposed to this suggestion felt that this would be a betrayal of the reforms of Vatican II. I am not here to make a case for either position, be it turning to face the people or turning to the East, as any heated discussion often entails further divisions among the People of God in the current climate. Both options, eastward and toward the people, are permitted. One may have a preference and have good reasons why they hold that preference. However, when both options are permitted we should not seek to denigrate something that is less optimal to us. Let us return to the story of the Journey to Emmaus. One can discern the very elements of the Mass in this passage: Scripture, homily, prayer, blessing and the breaking of bread, commissioning. Everything in the story leads us in this direction – the pinnacle of our Christian journey, the climax of our liturgy and the source of mission is the life-transforming encounter with the Lord. He is the goal, the heart and centre of our liturgy. At end of their journey, a journey that takes them from despondency to hope, grief to joy, self-centredness to God-centredness, the two disciples can finally recognise the Lord at the breaking of bread. Here, as they face their true East, Christ, the Risen One, the Sun of Righteousness, they recall how their experience of travelling with the stranger had rekindled the burning flame of faith in their hearts that had almost been extinguished by their self-absorbed grief. The fact that the Lord initially vanishes from the sight of these two disciples, teaches us that He is no longer seen by the eyes of the flesh, but by the eyes of faith and the eyes of the heart. So, though He is gone from our earthly, fleshly, carnal sight, He is now to be seen in the Sacrament of the Altar, and experienced in the liturgy and other sacraments. And just like the two disciples who spoke of how the flame of faith within them were rekindled by the Lord, may our faith too be rekindled at every mass. Let us always hunger for this act of worship, for we were made to worship God in this way – right there, front and centre. Let us not be so absorbed with our own worries, concerns and personal agenda to risk not recognising the Lord in the Eucharist. We are likely to miss seeing Him when we become too preoccupied with our dashed hopes and frustrated plans or even our insatiable need to be entertained. As we all make this interior turn to the East, to Christ, let us heed these wise words of Cardinal Sarah given at another interview. “The liturgy is the door to our union with God. If the Eucharistic celebrations are transformed into human self-celebrations, the peril is immense, because God disappears. 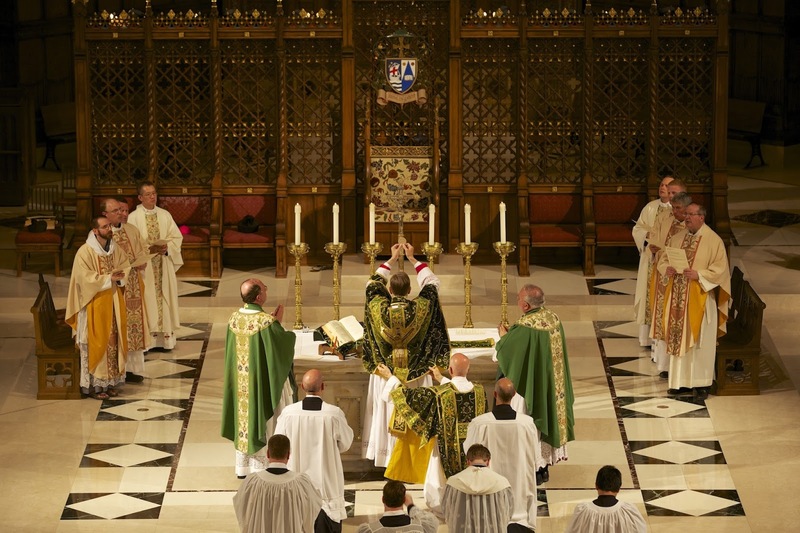 One must begin by replacing God at the centre of the liturgy. If man is at the centre, the Church becomes a purely human society, a simple nonprofit organisation, like Pope Francis has said. If, on the contrary, God is at the heart of the liturgy, then the Church recovers its vigour and sap!” Conversi ad Dominum – Let us turn to face the Lord.